I think it can be said that every child and college student at one time, has lived on the blue box of Kraft Macaroni & Cheese. I certainly have, and there are moments it seems too easy and cheesy that I find myself wishing I had some on-hand. Though it’s simple to make, there is something off-putting about the packet of dehydrated-neon-orange-cheese-powder, which makes me wonder what I’m really ingesting? It surely isn’t cheese from a California cow! Since I’m a huge mac fan, I decided to make a homemade batch of Mac & Cheese, sans the blue box. I rarely attempt to make this from scratch because I know just how much actual cheese, butter & cream are required, to achieve the traditional cheesy texture. It always seems too indulgent, so I decided to lighten it a bit and add some orange of my own – healthy butternut squash! A vegetable? It may sound a little odd, but butternut squash is mild & hearty, and when cooked then pureed, has a creamy & rich texture. In fact, it is so smooth you won’t even be able to taste it, nor will your kids if you’re looking to be sneaky. We will still be using cheese, but ours will be from cow’s milk, not a paper packet :) Going to use fat free half & half instead of the whole milk or cream, also a small amount of butter, but we have to draw the healthy line somewhere! The pasta is pre-boiled and we make our creamy sauce on the stove top, then the combo is transferred to a casserole dish and baked. Opted to go the more traditional southern route and top with a thin layer of fine bread crumbs, giving us a little texture. This dish is fairly easy to do and really comforting. Also, serves-up great alongside dinnervine classic sloppy joes, well, that’s assuming you don’t want to eat the casserole as your main meal… and that’s not hard to do I’ve found. Here’s the happs on a Mac & Cheese you can feel good about! 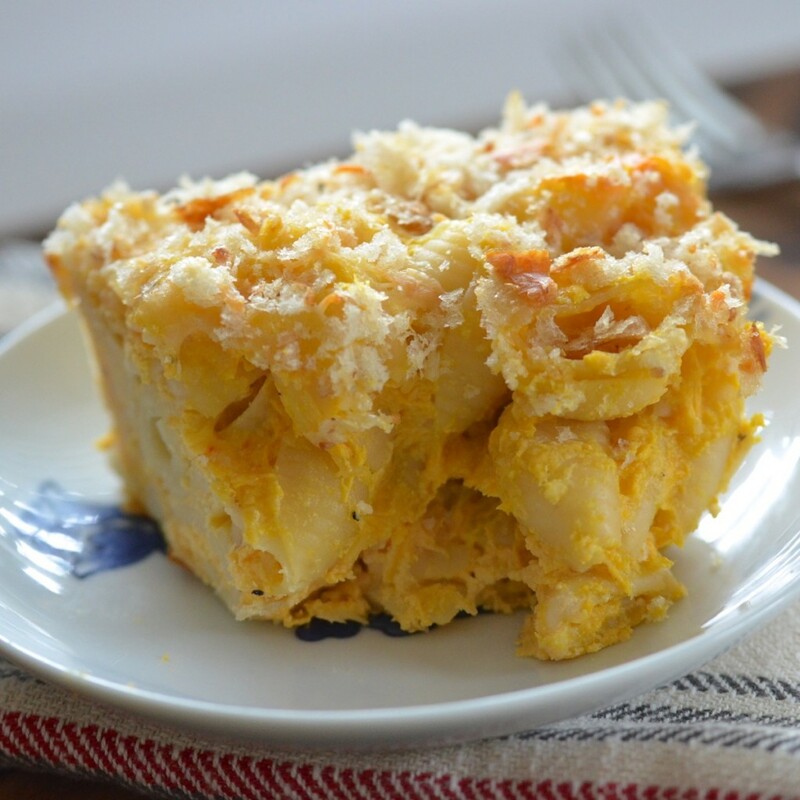 Homemade Macaroni & Cheese gets a hidden, healthy orange ingredient you won't even see! We're using creamy pureed butternut squash in our lighter cheesy sauce, and baking them in the oven for a healthier version of this classic. Who needs the box macaroni anyway?! 1 tsp Extra Virgin Olive Oil (for bread crumb mixture). Grease an oven safe casserole dish with butter. Prepare breadcrumbs in food processor, to a fine texture. In small bowl combine finely-grated sourdough bread crumbs with 1 tsp EVOO, and dash salt & pepper. Boil cubed butternut squash on stove till very tender with test of a fork, then drain in colander (being careful not to over boil!). In a food processor, puree cooked butternut till thoroughly smooth ( les than a minute). In large pot of well salted water, boil pasta till al dente (for shells about 9 minutes), rinse with warm water, drain well in colander & set aside. In non-stick pot on stove, combine squash puree, half and half & butter and whisk to combine over low heat. Once combined, raise heat to medium-low and add shredded cheeses, whisking until melted and sauce begins to thicken (watch temp to make sure it is not too hot so dairy doesn't separate). Stir in cooked pasta in batches to coat well. Transfer cheesy mix to your prepared casserole dish, spreading pasta into an even layer. Now sprinkle top of pasta with thin layer of prepared fine breadcrumbs. Bake mac & cheese in oven for 15-20 min, till well heated throughout (don't overbake or it will dry out!). This one still has all the creamy cheesy goodness of macaroni & cheese, but we lighten it up a bit substituting low fat half and half for cream and using low fat sour cream and cheese. Also butternut squash gives a healthy vegetable serving with fiber and antioxidants, and all you will taste is cheesiness! You can substitute other pasta like traditional elbow macaroni, but I used shells. Also, avoid keeping this one in the oven too long, I kept mine on warm for quite awhile waiting for company and it will dry out a bit in oven for extended periods of time:) Great with Sloppy Joes or BBQ! Serving size: side dish portion! Now is the season for butternut squash, and it’s readily available at your local farmers market. If you don’t have the time to trim & cut one, many specialty grocers have fresh, uncooked butternut squash already cubed for you in a bag! This recipe doesn’t take long and is easily spiced up with different varieties of cheese. Next time I plan to work some pepper jack into the mix. Also, you can add more butternut squash and shredded cheese to make this as rich as you so desire! More often than not, healthy vegetables and cheesy mac have lived on opposites sides of the dinner plate, but now they don’t have to. United in one crafty bake, we’ve created a home-style classic with less guilt & real, wholesome ingredients.